As described in the Overview, when authenticating requests using the Authorization header, you have an option of uploading the payload in chunks. You can send data in fixed size or variable size chunks. This section describes the signature calculation process in chunked upload, how you create the chunk body, and how the delayed signing works where you first upload the chunk, and send its signature in the subsequent chunk. The example section (see Example: PUT Object) shows signature calculations and resulting Authorization headers that you can use as a test suite to verify your code. When transferring data in a series of chunks, you must use the Content-Length HTTP header to explicitly specify the total content length (object length in bytes plus metadata in each chunk). This requires you to pre-compute the total length of the payload, including the metadata you send in each chunk, before starting your request. The x-amz-decoded-content-length header contains the size of the object length in bytes. Each chunk signature calculation includes the signature of the previous chunk. To begin, you create a seed signature using only the headers. You use the seed signature in the signature calculation of the first chunk. For each subsequent chunk, you create a chunk signature that includes the signature of the previous chunk. Thus, the chunk signatures are chained together; that is, the signature of chunk n is a function F(chunk n, signature(chunk n-1)). The chaining ensures that you send the chunks in the correct order. Decide the payload chunk size. You need this when you write the code. Chunk size must be at least 8 KB. We recommend a chunk size of a least 64 KB for better performance. This chunk size applies to all chunks except the last one. The last chunk you send can be smaller than 8 KB. If your payload is small and can fit into one chunk, then it can be smaller than the 8 KB. Create the seed signature for inclusion in the first chunk. For more information, see Calculating the Seed Signature. Create the first chunk and stream it. For more information, see Defining the Chunk Body. For each subsequent chunk, calculate the chunk signature that includes the previous signature in the string you sign, construct the chunk, and send it. For more information, see Defining the Chunk Body. Send the final additional chunk, which is the same as the other chunks in the construction, but it has zero data bytes. For more information, see Defining the Chunk Body. The following diagram illustrates the process of calculating the seed signature. The following table describes the functions that are shown in the diagram. You need to implement code for these functions. Lowercase() Convert the string to lowercase. Hex() Lowercase base 16 encoding. SHA256Hash() Secure Hash Algorithm (SHA) cryptographic hash function. HMAC-SHA256() Computes HMAC by using the SHA256 algorithm with the signing key provided. This is the final signature. Trim() Remove any leading or trailing whitespace. URI encode every byte except the unreserved characters: 'A'-'Z', 'a'-'z', '0'-'9', '-', '. ', '_', and '~'. The space character is a reserved character and must be encoded as "%20" (and not as "+"). Each URI encoded byte is formed by a '%' and the two-digit hexadecimal value of the byte. Letters in the hexadecimal value must be uppercase, for example "%1A". Encode the forward slash character, '/', everywhere except in the object key name. For example, if the object key name is photos/Jan/sample.jpg, the forward slash in the key name is not encoded. The standard UriEncode functions provided by your development platform may not work because of differences in implementation and related ambiguity in the underlying RFCs. We recommend that you write your own custom UriEncode function to ensure that your encoding will work. The following is an example UriEncode() function in Java. This header is required for all AWS Signature Version 4 requests. 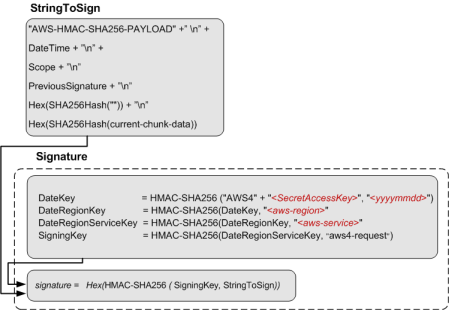 Set the value to STREAMING-AWS4-HMAC-SHA256-PAYLOAD to indicate that the signature covers only headers and that there is no payload. Set the value to aws-chunked. That is, you can specify your custom content-encoding when using Signature Version 4 streaming API. Amazon S3 stores the resulting object without the aws-chunked encoding. Therefore, when you retrieve the object, it is not aws-chunked encoded. x-amz-decoded-content-length Set the value to the length, in bytes, of the data to be chunked, without counting any metadata. For example, if you are uploading a 4 GB file, set the value to 4294967296. This is the raw size of the object to be uploaded (data you want to store in Amazon S3). Set the value to the actual size of the transmitted HTTP body, which includes the length of your data (value set for x-amz-decoded-content-length) plus, chunk metadata. Each chunk has metadata, such as the signature of the previous chunk. Chunk calculations are discussed in the following section. You send the first chunk with the seed signature. You must construct the chunk as described in the following section. IntHexBase() is a function that you write to convert an integer chunk-size to hexadecimal. For example, if chunk-size is 65536, hexadecimal string is "10000". chunk-size is the size, in bytes, of the chunk-data, without metadata. For example, if you are uploading a 65 KB object and using a chunk size of 64 KB, you upload the data in three chunks: the first would be 64 KB, the second 1 KB, and the final chunk with 0 bytes. signature For each chunk, you calculate the signature using the following string to sign. For the first chunk, you use the seed-signature as the previous signature. The size of the final chunk data that you send is 0, although the chunk body still contains metadata, including the signature of the previous chunk. The signature calculations in these examples use the following example security credentials. All examples use the request time stamp 20130524T000000Z (Fri, 24 May 2013 00:00:00 GMT). All examples use examplebucket as the bucket name. The bucket is assumed to be in the US East (N. Virginia) Region, and the credential Scope and the Signing Key calculations use us-east-1 as the Region specifier. For more information, see Regions and Endpoints in the Amazon Web Services General Reference. For more information, see Virtual Hosting of Buckets in the Amazon Simple Storage Service Developer Guide. You are uploading a 65 KB text file, and the file content is a one-character string made up of the letter 'a'. The chunk size is 64 KB. As a result, the payload is uploaded in three chunks, 64 KB, 1 KB, and the final chunk with 0 bytes of chunk data. The resulting object has the key name chunkObject.txt. You are requesting REDUCED_REDUNDANCY as the storage class by adding the x-amz-storage-class request header. The following steps show signature calculations. In the canonical request, the third line is empty because there are no query parameters in the request. The last line is the constant string provided as the value of the hashed Payload, which should be same as the value of x-amz-content-sha256 header. For information about each of line in the string to sign, see the diagram that explains seed signature calculation. 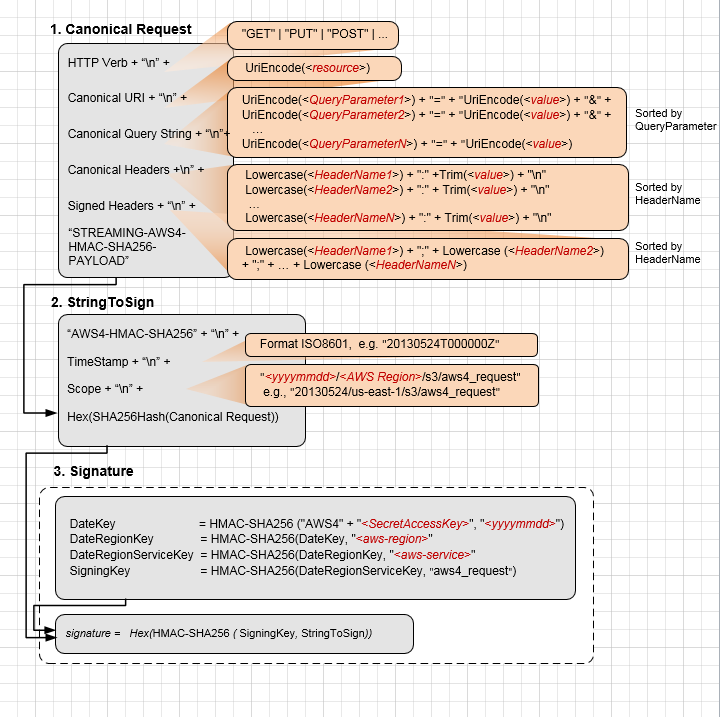 For information about each line in the string to sign, see the preceding diagram that shows various components of the string to sign (for example, the last three lines are, previous-signature, hash(""), and hash(current-chunk-data)).